Summary: This innovative, heartfelt debut novel tells the story of a girl who’s literally allergic to the outside world. When a new family moves in next door, she begins a complicated romance that challenges everything she’s ever known. The narrative unfolds via vignettes, diary entries, texts, charts, lists, illustrations, and more. 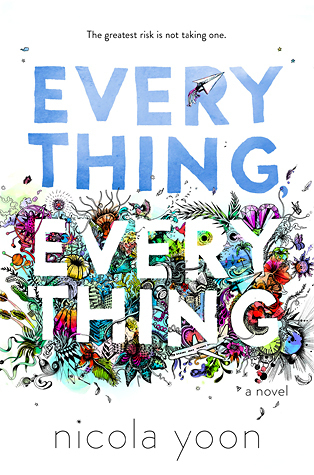 Review: I was surprised by how quickly I was charmed by Madeline Whittier (AKA Maddie), the biracial heroine of Everything, Everything. The first person point-of-view, which was threaded through with wit, loneliness, and later a fierce longing for the outside world—and Olly—combined with the sometimes cute, sometimes painful, but often hilarious illustrations/book reviews/etc. made for a heroine with a compelling personality and unique voice. Due to Maddie’s Severe Combined Immunodeficiency diagnosis, the bulk of the book’s action took place within her childhood home, online, or via the view from the windows, which furthered the intimacy of Maddie and her story. I looked forward to every commute so I could read more, which is definitely a win in my book. Carla and Olly were the two other standout characters in this book, though I was particularly fond of Carla. Her mixture of roles as nurse and companion provided Maddie with face-to-face friendship, a sounding board, and a co-conspirator. I loved the affection Maddie and Carla had for one another, especially when Carla repeatedly proved she wanted Maddie to be happy. As for Olly, once I got over how quickly he and Maddie fell for each other, I grew to like him a great deal. He isn’t as interesting as Maddie, troubled family situation notwithstanding, but he fulfilled his role in the story and had several wonderful moments—both friendship-wise and romantic—with our heroine. However, I do have one major concern with the story, which is practically impossible to discuss without ruining the book. (I did a brief search for other reviews, and the event in question appears as divisive as I anticipated it would be.) Suffice it to say, I came down slightly more on the side of thinking this event was a “cheat” as opposed to a paradigm shift that I enjoyed. It left a somewhat bitter aftertaste, but many other people seemed to love it, so your mileage will vary. I would love to see a contributor at Disability in Kidlit tackle this book, actually, for a more informed opinion. Edit: Here is Disability in Kidlit’s review of the book, which I suggest you read. Recommendation: Get it soon if quick, sweet romances are your thing. Nicola Yoon’s prose and David Yoon’s illustrations have created a lovely portrait of a young woman who deals with both isolation and love so deep it can be painful. Maddie is a wonderful character, and her involvement with Olly hits many of the best romance notes. Unfortunately, the ending of this book kept me from completely loving the story, but I am still looking forward to Yoon’s next book.